So far, most enterprises have only addressed the opportunities for using social media in marketing. They have adapted their marketing strategies to benefit from the new revenue and branding opportunities provided by social media. 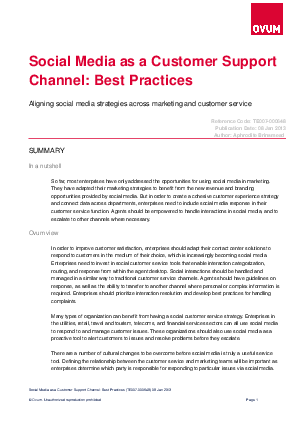 But in order to create a cohesive customer experience strategy and connect data across departments, enterprises need to include social media response in their customer service function. Agents should be empowered to handle interactions in social media, and to escalate to other channels where necessary.